Prepare students to engage in a rigorous career exploration, decision-making, and planning process in high school. Introduce students to the 10-year Plan process and get them enthused about becoming long-range planners as they enter high school. 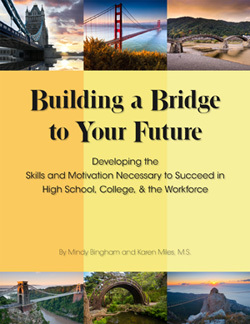 As the newest addition to the Career Choices series, this cutting-edge curriculum was designed as a bridge to the high school curriculum offered throughout the country as a Freshman Transition course in 9th grade. Research techniques using the free, open-source U.S. Department of Labor web sites so, no matter where they are in their career trajectory, help is always readily available. Employability skills and traits so once they get a job, they keep it; these skills are applicable not only to success in the workforce but also throughout their educational journey. As the early adolescent begins to understand the importance of having a long-range plan, they will come to appreciate that a meaningful and carefully-researched career and education plan puts them in control of their future lives. It is the unexpected that makes this curriculum so important and unique. Too many middle school students believe that they will not be successful in high school. This curriculum was designed to address those fears by helping students understand more about their attitudes, self-concept, self-motivation, and self-management. Woven throughout this beginning career exploration course are important activities for social and emotional development. Because they are learned in the context of planning for their future, these concepts have more meaning and students are more likely to embrace and practice what is learned. Discover what motivates them so they stay focused on their education over the long term. Study 21st century learning mediums that will help them take advantage of the new ways of mastering topics of their choosing. This coursework provide students time to reflect and grow -- increasing their self-efficacy as successful students -- and gives the teacher an opportunity to validate their improved readiness to engage in career exploration and decision-making. This will be of particular interest to schools and districts that have adopted the award-winning Get Focused...Stay Focused!® program. There are a variety of ways to integrate this important material into your school. Understanding how they think about learning and life gives young people important insights into their next steps as they transition to high school. They’ll see how what they learn in this course can help them be successful in their future academic life and work life. Order a 60-day review set by calling (800) 967-8016 or submit a request online. 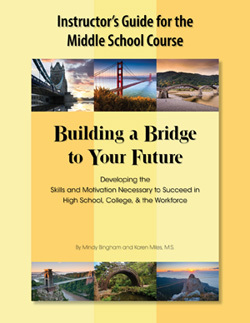 Table of Contents for the Middle School Instructor’s Guide Along with your workbook, you’ll receive a copy of the comprehensive Instructor's Guide for the Middle School Course Building a Bridge to Your Future. A comprehensive instructor’s guide provides detailed activity-by-activity presentation ideas, sample lesson and pacing guides, and planning and implementation strategies. For more details, call your Educational Consultant at (800) 967-8016.